Screenshot of the original public records request filed by Peter Vickery, MassLandlords Legislative Affairs Counsel. Unlike the April Fools article in this month’s newsletter, this article is no joke. 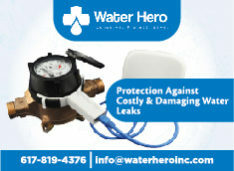 This serious press release was published on MassLandlords.net Thursday March 30. On March 27, public records released to MassLandlords contradicted a December 6 statement made by Boston Mayor Martin Walsh, that “the text of the [Jim Brooks] petition was the result of many months of conversations between the City, the advocacy community, and local property owners.” According to the records, no conversations took place with owners prior to the Mayor’s December 6, 2016 statement. MassLandlords submitted the public records request on January 31, 2017. 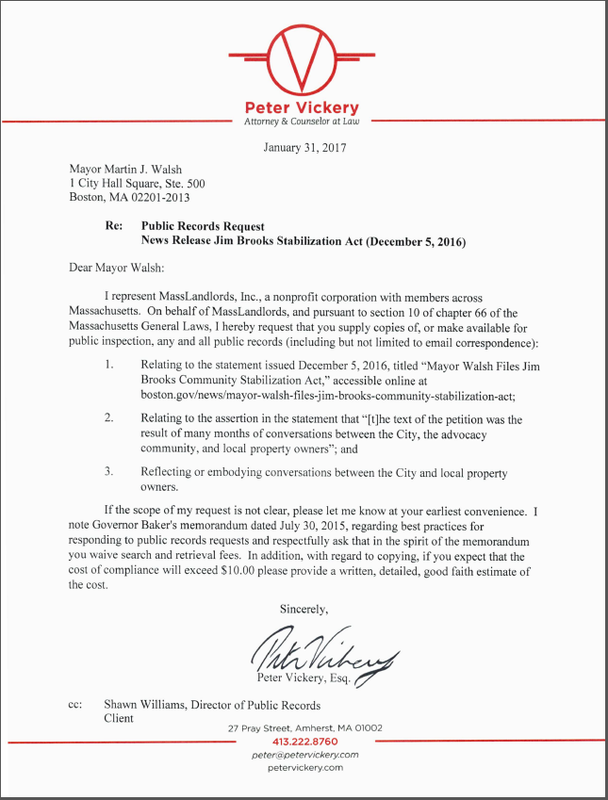 The Mayor’s Office replied only after MassLandlords filed an appeal with the Secretary of the Commonwealth on March 2, 2017. MassLandlords alleged the delay put the Mayor’s Office in violation of MGL Chapter 66 Section 10(b). Thirty-two percent of the public records and substantially all of the outgoing correspondence was addressed to advocates in favor of the Jim Brooks Act. Most of this was to Darnell Johnson of Right to Our City and Kathy Brown of the Boston Tenant Coalition. These two made all the public contributions to the text, including the name of the Act. One owner letter in the records was unsigned, “as I don’t want any repercussions from this letter.” No reply was possible. No correspondent identifying themselves as an owner voiced their support of the Mayor’s initiative. One property owner asked to participate in discussions at the city’s Department of Neighborhood Development. Sheila Dillon, Chief of Housing, DND, was asked to reply but did not. According to the records, on February 10, 2017, Lydia Edwards, Deputy Director, DND, made the only owner reply detailed enough to constitute a conversation. This came after the Mayor’s statement. MassLandlords strongly opposes the Jim Brooks Stabilization Act as a form of unlawful rent control and a violation of state and federal laws on fair debt collection. Most of the public records were related to sharing copies of the Jim Brooks Stabilization Act. MassLandlords’ Legislative Affairs Counsel Peter Vickery procured the public records. 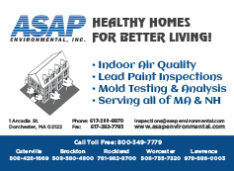 MassLandlords is a 501(c)6 trade association whose mission is to create better rental housing in Massachusetts. 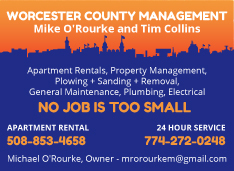 MassLandlords helps owners rent their property and advocates for better laws.